The illness or the environment? Is Ontario Shores responsible for high rate of violent incidents? Most mentally ill patients are more likely to be the victim of the violence than the perpetrator of it. Most evidence would suggest individuals experiencing mental illness are no more inclined towards violence than the general public. Yet among Canadian psychiatrists, 50 per cent have reported to have been assaulted by a patient at least once. Whitby’s Ontario Shores Centre for Mental Health Sciences has experienced a rise of incidents of workplace violence in recent years. In the last three months for which we have data (May, June, July 2012), the centre has experienced 90 reported acts of physical violence. The situation has led to an ongoing exodus from the employer. Many skilled workers choose to quit rather than continue to put their health at jeopardy. Only about a third of employees who were at the Whitby psychiatric hospital in 2006 (when it divested from the Ministry of Health) remain there today. This is an employer that used to be known for excellent retention of staff. Cuts to services have had an impact on activities at Ontario Shores, many recreational spaces getting turned into office space for an expanding roster of management. The Ministry of Labour is presently conducting its own major investigation into the Whitby hospital’s extraordinary rate of violence. Many staff have already been interviewed and more are expected to still meet with the investigator. Given the size of the investigation it is not expected that the Ministry will issue its report for some time. Many staff members wrongly believe that such incidents are part of the job and fail to report when they do take place. The OPSEU Local estimates the real impact is likely closer to double these reported figures. Nor do we have any figures on what the impact is on patient-on-patient violence as this is not shared with the union. • A worker required dental work after she was punched in the mouth while trying to remove dangerous and restricted items from a patient. • A worker sustained facial injuries after getting head butted and put in a choke hold by a patient he was escorting. • While performing nursing duties, a worker bent over to listen and make eye contact with a patient. She was told to “shut up” and punched in the nose, resulting in a contusion/fracture. • Trying to stop a patient from banging her head on a wall, the worker was scratched, hit in the head and kicked in the stomach, resulting in injuries to her abdomen and left arm. • After attempting to clean up a patient found eating her own feces, the patient became agitated and tossed feces at the worker. The worker was pushed up against the wall and her right arm twisted. • At the beginning of the night shift a worker was hailed by a patient who said he wanted to show her something. Walking very quickly towards the worker, the patient started making punching motions in the air. The worker retreated to a nursing station where the patient threatened to “smash her face in” the next time he saw her. While other psychiatric hospitals have made significant progress in reducing such incidents by working with the union, Ontario Shores appears more willing to blame the workers than address what is becoming a pandemic. If it is the environment, and not the illness, then Ontario Shores has work to do. The question is, will they do so willingly? This entry was posted in Uncategorized and tagged Dr. Heather Stuart, incidence of violence, Ministry of Labour investigation, Ontario Shores, Whitby psychiatric hospital. Bookmark the permalink. Yikes! Isn’t this hospital accredited by Accreditation Canada? How is that possible? … because they handed out a package telling their employees how to answer the Accreditation survey … so I’ve heard. It is these types of occurrences that stigmatize the mentally ill. It sounds like the hospital is in crisis where a safe and positive environment is needed to foster hope and recovery of the mentally ill. If staff is that vulnerable to violence and not protected, what are indefensible patients been exposed to? This is both shocking and appalling. Canadian Forces have been dispatched around the world to protect women from atrocities suffered at the hands of male dominated societies. In Canada nursing is a predominantly female profession and it is not a great leap to presume the majority of these victims of violence are female. Does anybody care? Who is in charge of this place and why is this story not front page news? Shame on Ontario Shores, shame on our gov’t, heads need to roll and please summon our Forces home and do something to protect these workers. My question is why would Ontario Shores even attempt to address violence in the work place??? They have gotten away with ignoring it thus far for so long….embracing the exodus of staff as they can hide and ignore what goes on behind closed doors. The administration is not at risk for physical or mental harm so it is dismissed by them. Staff is told violence is a part of their job and if they do not like it leave. Staff fearing for their lives leave and are replaced by new staff at a lower pay scale hence cost efficient. why have this administration been able to get away with this???? Does it take someone getting killed in workplace violence before the public and powers that be stand up and listen??? Worker safety used to be a priority in this workplace but not anymore. Thank goodness the MOL has heard the cries of our workers and have taken the lead. 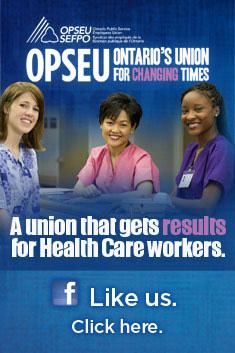 The present Ontario Shores leaders turn a blind eye and show disdain to workers who ask for support. Shame shame shame. Definitely the environment—-unqualified managers, a Board of Directors who have next to no background in health care (there is even an Oil Company exec), and nursing vacancies that continue to increase = the unprecedented injuries happening. When a hospital has higher violence rates than Corrections, something is truly wrong. Why is Deb Mathews not investigating this looming second ORNGE scandal -Ontarioshores Rampant Negligence Getting Exposed! Mrs. T — Glad you raised the point about stigma. Clearly we wanted to underline the problem is the workplace environment that is placing everyone at risk, not the illness itself. Ontario Shores needs to learn from other hospitals that it is possible to create and healthy and safe environment for patients, visitiors and staff. Wow.Truly astonishing. I had to read the story twice to fully comprehend the magnitude. I too share the concerns expressed by Mrs. T. regarding safety of patients. Why are these occurrences apparently “secret?” If staff safety means so little to this employer than why would anyone presume that they care about patient safety either? I’d like to hear from someone associated with this organization and curious what “they” and the Health Minister has to say about this total disregard for humanity… patients and caregivers alike. And to Cora…An Oil Exec on a Mental Heath Centre Board? Instead of envisioning oil drenched ducks I am trying to ward off unimaginable images of care givers and recipients of that care having been made aware of the rate of violence at Ontario Shores. Ontario shores is the “center of excellence” don’t you know??? One of their core values is “safety”. My husband and I know a front line staff that work there. The morale is so low because of safety issues and management not caring. Some of the horror stories I’ve heard is some psychiatrists demanding that front line nurses put themselves at risk. It’s not the psychiatrists that get hurt as I’ve heard most of them run away when a patient becomes aggressive. Most hospitals have open board meetings. Ontario Shores board meetings are closed. What are they trying to hide? Are they afraid the board members will be told what staff really have to put up with on the wards. It’s a shame what I’ve read in this article as well that “Ontario Shores are more willing to blame the workers then addressing what’s becoming a pandemic” It’s easier to blame the workers then look at how managers are managing a (once well run but now poorly run) psychiatric hospital. The government should never have divested this once respected Mental Health Care Facility which, in it’s day, was truly the center of excellence when it was run by management that had knowledge about the care of mental health patients. I’m sitting here shaking my head in disbelief. What a crock!!!!! I think the Ministry of Labour should take a look at the staff’s work environment. I worked at Ontario Shores from 1985 to 2001. I left there because I saw what was coming- more forensic patients, personality disorders who don’t give a damn for human life, and doctors who play around with medications. As if the management team at Ontario Shores would back the front line staff who were absolute professionals and who got injured on the job?. The rise in violent events come down to lower staffing and cutbacks. i had my knocks and hits too. I had to go to the hospital for 3 stitches in my lip after a patient kicked me in the mouth. i was put in several violent situations through the years, kicked, almost strangled, scratched, and punched. I was also on shift a few months before i left the job when a personality disorder went up to a 6 month pregnant nurse and punched her in the stomach repeatedly. it was a total calculated act when the patient knew people were on their supper break. i escorted the nurse to the hospital to be checked out. MD was the RN in charge and he was one of the best. he knew his stuff. shortly after coming back from the hospital we had another code white. this time on the forensic unit. a patient took a huge heavy table and smashed PC ( an RN) right in the chest area. he was off work for a very long time. his coworker was also attacked by the same patient and had his eye brow split open. I am really p-d off and I hope the Ministry of Labour sees just how dangerous working at Ontario Shores is for the staff and the upper management is investigated and found in the wrong. I was at the point before leaving Ontario Shores that I feared getting severely hurt and maimed for life and who the hell would have backed me? The management were known to side with the patients rather than the front line staff. Will it take an Inquest to smarten the Management up?. It happened there before. I have the deepest respect for the RN’s and RPN’s at Ontario Shores. They sure taught me a lot and I side with the front line staff. Thank you OPSEU and Diablogue for providing invaluable and otherwise “secret” information by exposing the atrocities our Ontario workers are facing on a daily basis. Also appreciate a forum for citizens to voice their outrage. Where on earth is the Minister of Health in this? Where is the Board of Directors? Diablogue aired this story 10 days ago. If violence incidents continue unrestrained and essentially ignored we can expect at previous rate, there have been 10 more REPORTED violent incidents since this story was aired. How many injuries? How many more lives are going to be allowed to be placed at risk? Does ANYBODY give a damn???????? Of note above is that “May, June, July 2012, the centre has experienced 90 reported acts of physical violence”. Spread out over three months, that number translates to one documented incident involving physical violence PER DAY!!! And those are the reported incidents. Sounds like if the staff attrition due to unsafe environmental issues, coupled with the non- reported incidents were to be included in the numbers, the total of incidents would be beyond unacceptable. Perhaps some of the excessive management salaries could be better used towards crises management training and security support for the front line staff. The entire program is only as good as the front line staff. Without them, there is no rehabilitation – no matter how many behavioural plans and/or recovery plans are developed, they’re useless without the front line staff required to implement, monitor and document the results. Shame on Ontario Shores for their lack of respect for their workers – and shame on the Government for looking the other way and not holding Ontario Shores accountable for their abysmally poor stats and outcomes!!! The increasingly growing forensics department brings with it mental health patients with a long history of violence would be the biggest reason for an increase in staff assaults since 2006! Great neighbourhood as long as you know who your neighbours are!! I am a little concerned about the lack of concern demonstrated by the people in charge of this Hospital. If the management cannot or will not protect their staff…I can not count on them to protect my neighbourhood! BTW…Why weren’t the residents (who live in Whitby Shores) notified about the Emergency Drill last Thursday Nov 15th held at 7:30 in the evening? What worries me is the “Domino Effect” that seems to occur at Ontario Shores. Firstly, they completely discourage any family involvement whatsoever. That also includes their refusal to return any calls made by concerned family members. In fact, the only point of contact they seem to have is either when the police are involved or when they suddenly phone the family hours before their family member’s discharge to announce that they are to be picked up (usually within less than 24 hours). That gives the “receiving” family member only hours to come up with “things” to keep their loved one busy. If there was communication, the family would have ample opportunity to prepare for their loved ones return. Also, sadly so, but the push at Ontario Shores is s-e-x and the importance of it and the condemns and the “room” in case they get the urge. I wonder how they can make decisions for themselves like that when they are too ill to be anywhere but Ontario Shores. It’s a well-known fact in the high schools that if they (a student) does not want to live by the rules of the house, then there are “ways” to get into the “Shores: including “cutting” if that is what it takes. Once at Ontario Shores, they are free to do whatever they want; with whomever they want. The patients seem to respect each other as they all do just that RESPECT EACH OTHER.